I had a subscription with coffee-mongers Pact last year, but for a couple of reasons it wasn’t destined to be a long-term thing. Firstly, their coffees were generally on the weak side for me and secondly I simply couldn’t keep up with a new coffee from them every fortnight in addition to all the other coffees I like to try. I pretty much said as much in my “why are you cancelling your subscription” questionnaire and to their credit, Pact have listened. They have a new monthly option available, and say their range has darker and stronger options. As I said in an earlier post, I love the idea of coffee magically appearing through my letterbox, so I decided to give them another go. Fig Pudding Espresso is a great-sounding re-introduction to their range, offering a “rich, heavy fig and hazelnut” coffee. The grounds certainly have a rich aroma; nuts soaked in golden syrup with dark cherry fruit lurking. Brewed, it’s still rich and nutty but an acidic edge starts to come through, too. 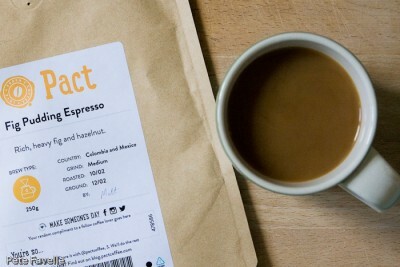 In the mouth, the acidity hits first and is quickly balanced with a warming, slightly fruity sweetness. There’s plenty of bitterness in the background, and it manages to be simultaneously powerful and restrained. The finish is nicely tannic, and leaves you reaching for another sip. This is a bold and well-balanced coffee that is much more to my taste than previous Pact offerings – 4 stars, and I can’t wait to see what the next delivery brings!